One of my favorite possessions is a gilded mirror that hangs over my dresser. The mirror has seen better days: bits of wood have fallen off of its detailed design, the mirror itself is scratched and aged. A friend of mine recently suggested I get it restored but its rough appearance is precisely why I like it so much. Every scratch helps tell its story. 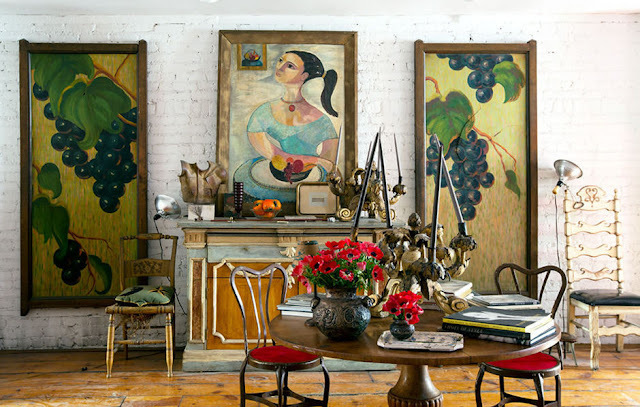 I think every room needs an element like that — one with serious patina. 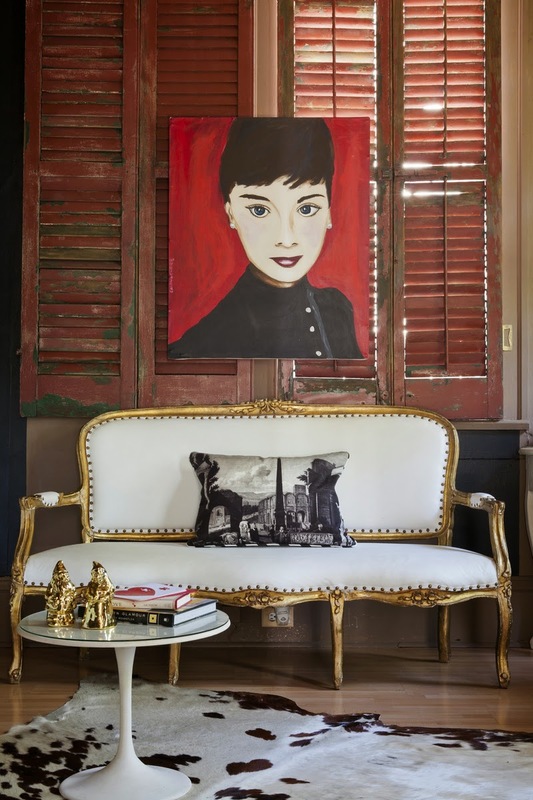 I love the look of an all-white space with a rougher wooden piece thrown in or a painting that has transformed with age. For this month’s post, I’ve gathered together some of my favorite spaces with patina, in both large and small doses. 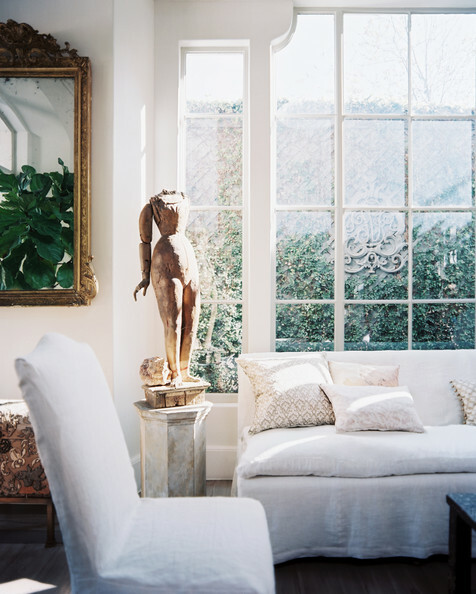 Designer Barbi Rushing’s countryside estate just outside of Little Rock is filled with beautiful antiques. From the moment you walk through the front door, you’ll realize every piece is not only beautiful, but meaningful as well. 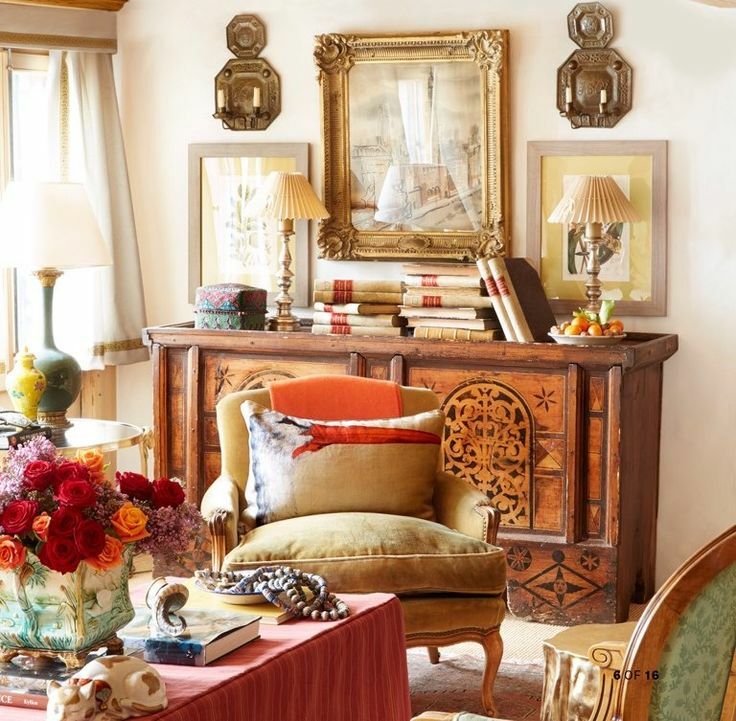 The home was built to encompass a set of antique French trumeau doors that lead into the dining room. The bronze doré chandelier hanging over the table belonged to Barbi’s grandmother. And, the center tablecloth was made specifically for luncheons her mother hosted. Along with the family pieces handed down over the years, Barbi effortlessly mixes in pieces she has found using her own artful eye. “I have always loved antiques and beautiful pieces, and I believe all pretty things go together,” says Rushing. 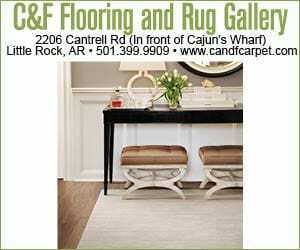 Read the whole story online here or find a copy of the April issue on newsstands. I am very inspired by history. Unfortunately the years have not always been kind to many of the items I find. So a restoration is, almost always, essential. seems to be an ever growing trend. Funny, one of the reasons I am so drawn to this concept is because I am more of an Un~trender. I am very particular and love the thrill of discovering a unique and uncommon item. Or even turning a common item into something other than it’s intended purpose. To me, Different is Good! That is also true when styling your home for Sale. Keep in mind, though, you need to keep it somewhat neutral . Finding this balance can be somewhat of a challenge. Always remember, Simplification is key. 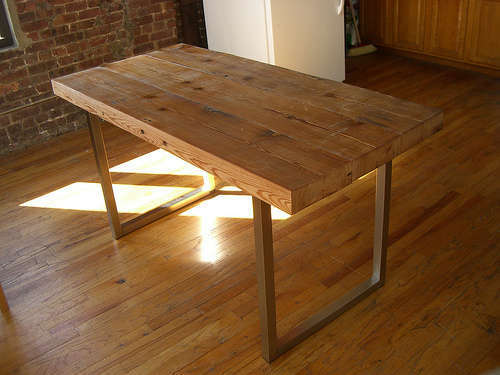 Here is an example of a table made from recycled wood and metal. Go to instructables.com for the how to. I also know some local places that build custom pieces. 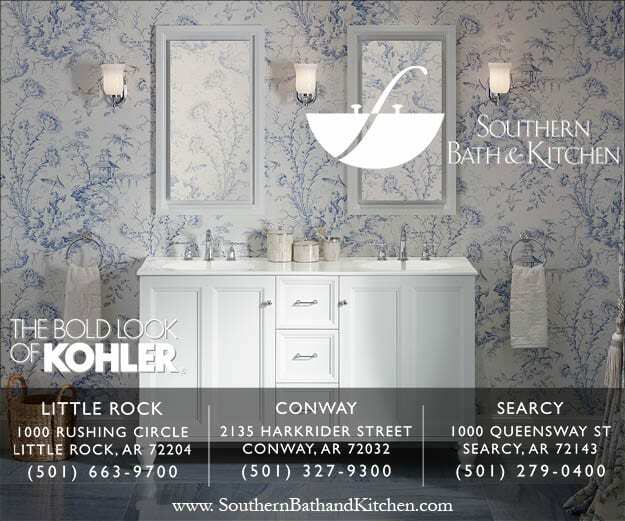 I can help you with the design. 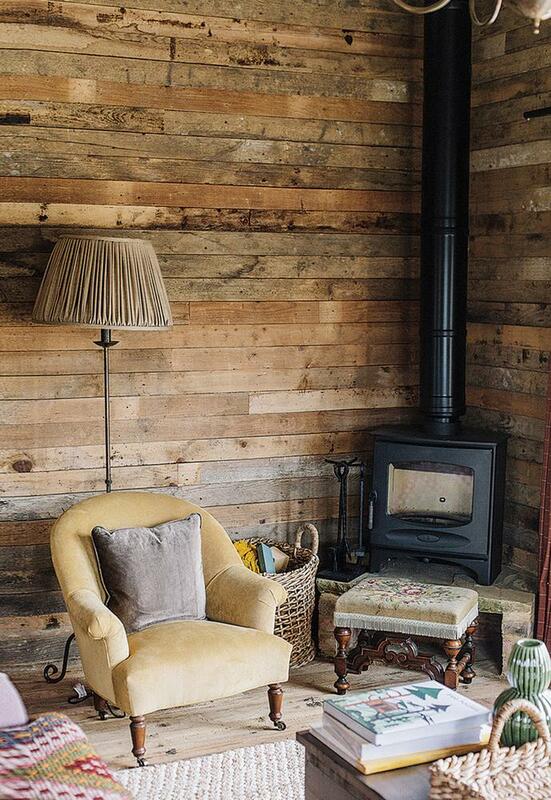 A great way to add style to any space is by using reclaimed wood to cover a wall. Discarded wood pallets are a cheap (sometimes free) way to stay in budget. All you need is a saw, a nail gun or hammer,nails and the found lumber. but want to run far away when you hear the term DIY. There are endless options available for purchase. These great pendant lights would look great over a kitchen bar or dining table. I think certain art should be reserved for when you don’t have your house for sale. It can sometimes be too personal and distract from what buyers are actually there to see, THE HOUSE. Since eating is pretty much universal, these letters are a great choice for a kitchen or breakfast area. What a fun project for those rainy spring days. Drinking the wine for the corks may be a little fun too! Garage Sales and Estate Sales are great places to find unique items at reasonable prices to restore. 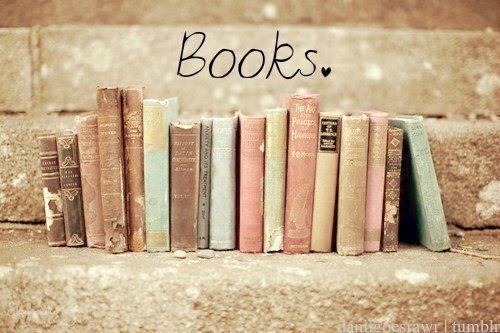 Books are always in style and are perfect for bookshelves!!! And any other surface for that matter. 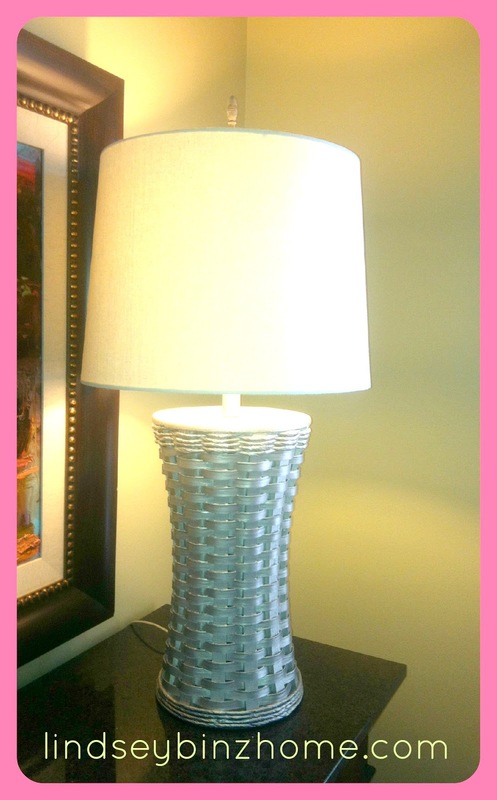 I recently found this woven lamp at a local estate sale. All it needed was a little clean up, some paint and a new shade. I was especially drawn to the shape and texture of this one. Lamps are one of the best ways to liven up a space. 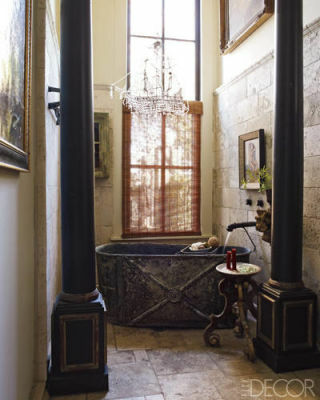 They not only serve as a source of light, they add ambiance and finish off a room. A sure way to have potential Buyers remember your house~ have this one on display! Who doesn’t need a little humor on their house hunting trips!